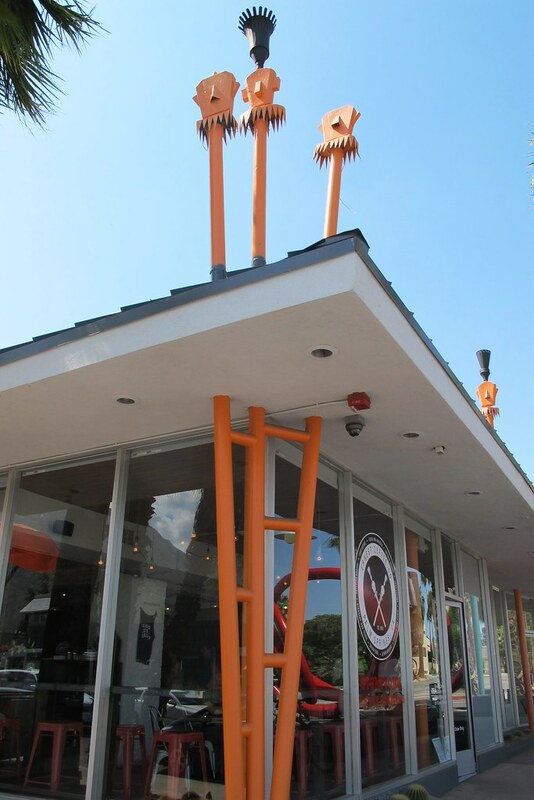 The tiki torches on top of the roof are one of the few remaining relics from the Palm Springs branch of Don the Beachcomber that occupied this building from its opening in 1953 through the ’80s. 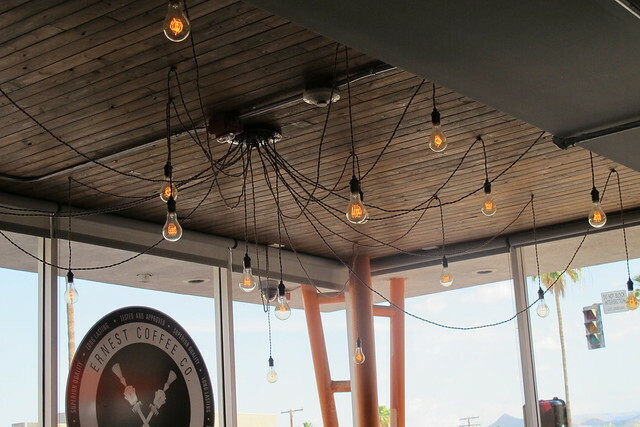 Like the Hollywood original, this desert sequel was a Polynesian-inspired hotspot frequented by celebrities. 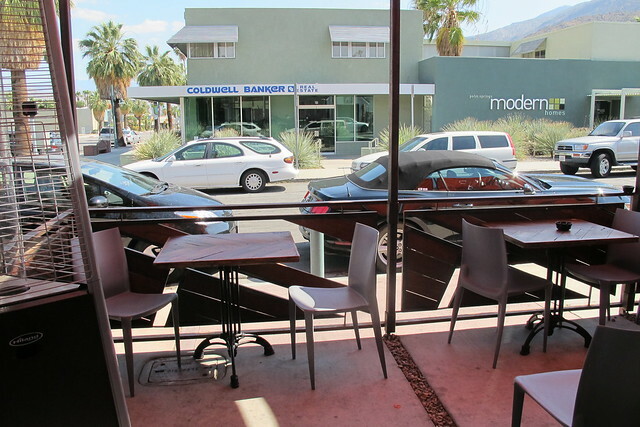 It’s located on North Palm Canyon Drive in the Upper Design District of Palm Springs, so it’s convenient to some great mid-century modern furnishing stores and fun shops like Raymond | Lawrence and Shag: The Store. 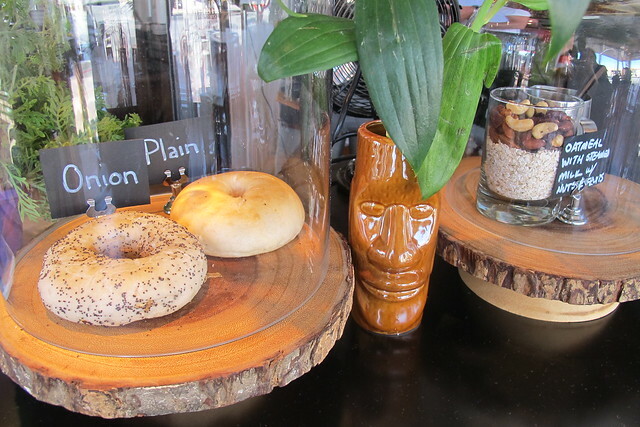 The only touch of tiki I noticed in this space was this Dynasty Easter Islander mug serving as a planter. 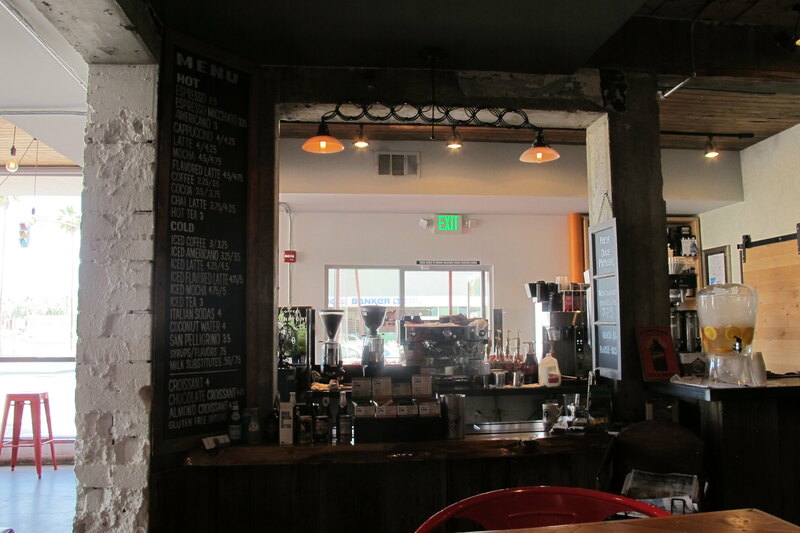 Rather, the design is pretty industrial with concrete and reclaimed wood contrasting with bright red and silver metal chairs. 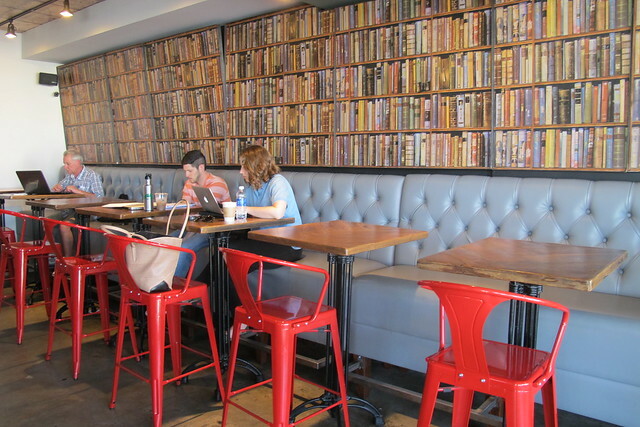 Along the right wall, opposite the coffee bar, is a gray raised banquette and a library of faux book shelves. It’s the preferred spot for people to hunker down with their laptops to write the next Great American Novel. A shaded patio runs along West Via Lola Street and continues to the entrance of Bootlegger Tiki. If you can take the heat, you can enjoy some nice views of the mountains. 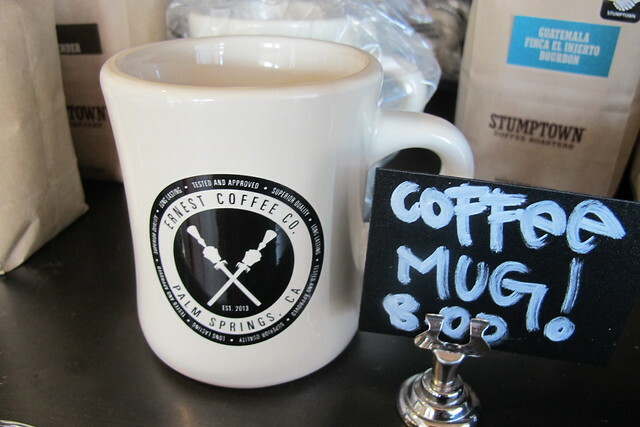 Ernest serves up Stumptown Coffee and all the espresso drinks one would expect: americano, latte, mocha, etc. (plus iced versions, but no blended beverages). I hear they also make a mean dirty chai. 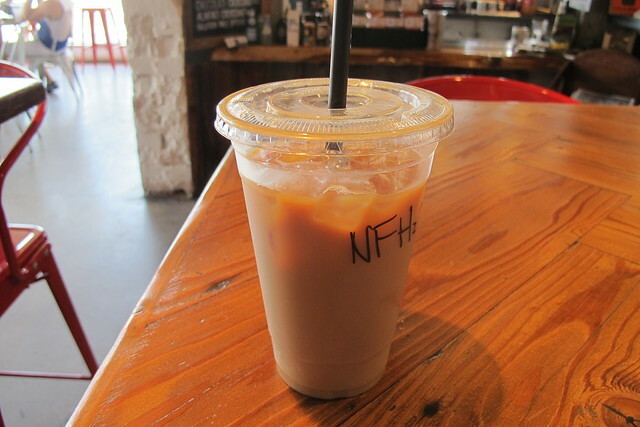 A large iced hazelnut latte was a refreshing pick-me-up after touring the nearby House of the Future (aka the “Elvis Honeymoon Hideaway”). Admittedly, I was also biding my time until Bootlegger Tiki opened at 4 p.m. 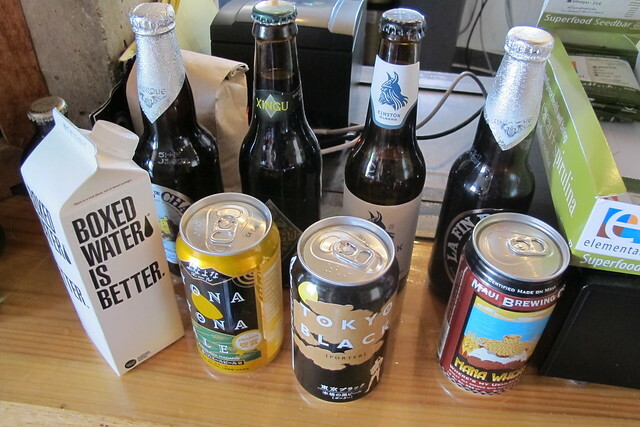 If you’re looking for something stronger, there’s also wine, mimosas with fresh orange juice and several bottled beers including Mana Wheat from Maui Brewing Co., Unibroue’s La Fin du Monde and Einstök Ölgerð Icelandic White Ale. 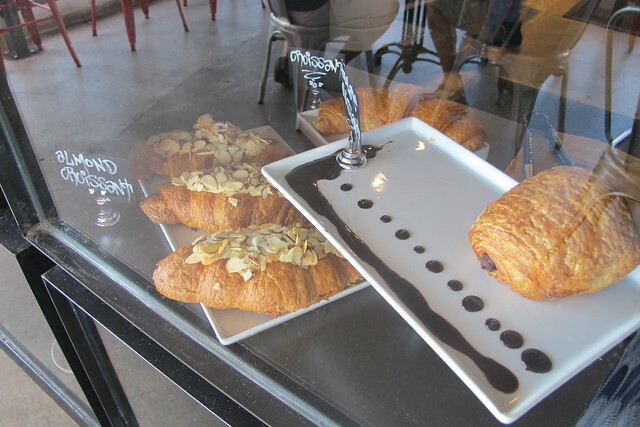 A variety of pastries are available — almond croissants, muffins, danishes, date scones and chocolate escargot — plus bagels and oatmeal. 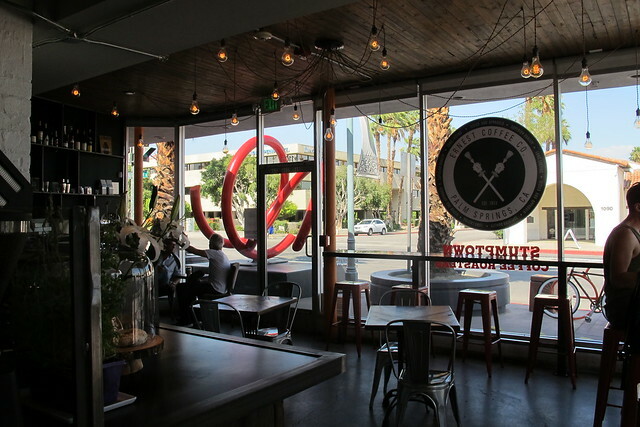 In the afternoon, patrons can compose their own platters of cheese and charcuterie. 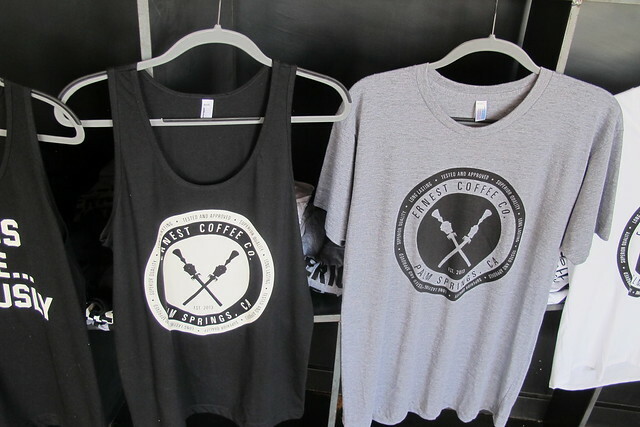 There’s a great display of merchandise with Ernest Coffee Co. logo coffee mugs ($8), tank tops ($20) and t-shirts ($25) with the logo or the slogan “Serious Coffee…Seriously”. I snagged the last gray logo shirt — it’s super soft! You can also buy Bootlegger Tiki souvenirs like flasks, pint glasses and cocktail shakers, Stumptown Coffee beans and other goodies. 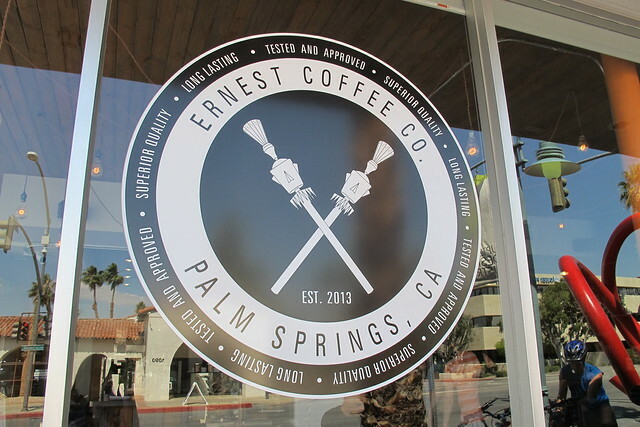 Ernest Coffee Company is open every day from 6 a.m.-7 p.m., with happy hour 4 p.m.-6 p.m. offering half-price house wine and $3 beers. Since alcohol is served, it’s technically supposed to be a 21-and-up crowd. 1101 N. Palm Canyon Dr. I read about this place recently in AAA mag i think. Sounds cool. I like how they are utilizing the tiki torches in their logo. Pretty clever. I’m going to be doing a wine judging at the OC fairgrounds on June 6th and am planning a side trip to Tiki Ti if you want to meet. And yay! No more smoking in there! 🙂 You have my email.